The Shindo Monbrison is a full-function stereo preamplifier. I've also owned the Monbrison for over 2 years, have heard it in many systems and it was and remains one of my "Best of" hifi discoveries. Now I'm not suggesting that I "discovered" the Shindo Monbrison. We all know Ken Shindo did. I was fortunate, just like Patrick, that Jonathan Halpern of Tone Imports discovered Shindo and decided to import his creations into the US. The same holds for Auditorium 23 and LignoLab. And while EMT didn't need discovering, I don't believe we'd be seeing as much interest in their current production mono and 78 cartridges, especially the 'international' or 'SME standard' mount versions, if not for the association with Tone Imports. The Tone Imports Special then. I also want to mention that Jonathan is a friend of mine which I mention for any number of reasons but decidedly not because my pants are on fire. The Radford STA-15, in production from 1962 to 1965, is one of a few famous partners for the Quad ESL-57. Since I knew little about this amplifier, I asked Patrick if he would share some. Here's an excerpt from his response: "The amp is the STA-15, Series 3 [I've attached the relevant page of the Radford brochure]. 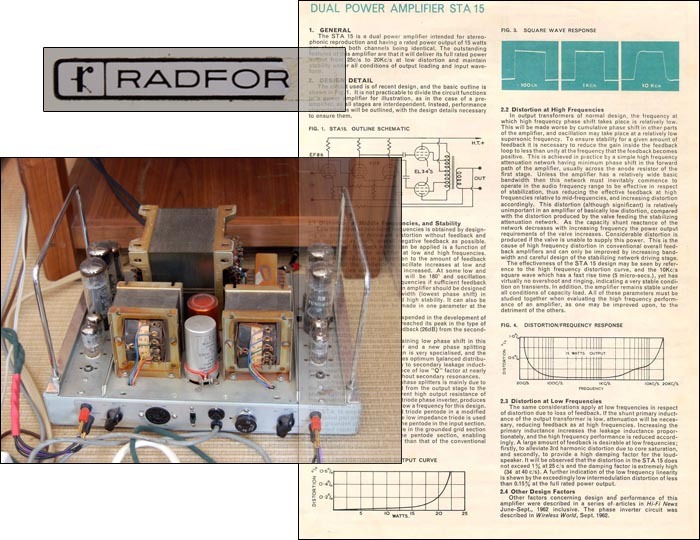 Really the point is that the output transformers are of such high quality that Arthur Radford was able to get away with a circuit design that really shouldn't work. The crux if I remember correctly is the "long-tailed phase splitter" around the 6U8 (see end of section 2.1 and beginning of section 2.2). There was much head-scratching about this in the Tube DIY section of Audio Asylum a few years back. "There was supposedly one woman who hand-wound all the Radford transformers... when Renaissance took over the Radford brand in the early '80s, they took her out of retirement or something to continue making the trannies, and some dealers in the UK still have stocks of NOS Radford transformers that she wound. The other key point is the beginning of section 2.1: "Low distortion at mid-band frequencies is obtained by designing an amplifier for minimum distortion without feedback and then applying as much overall negative feedback as possible." "Needless to say, it would be tough (impossible?) to find any amp designer subscribing to such a theory today! 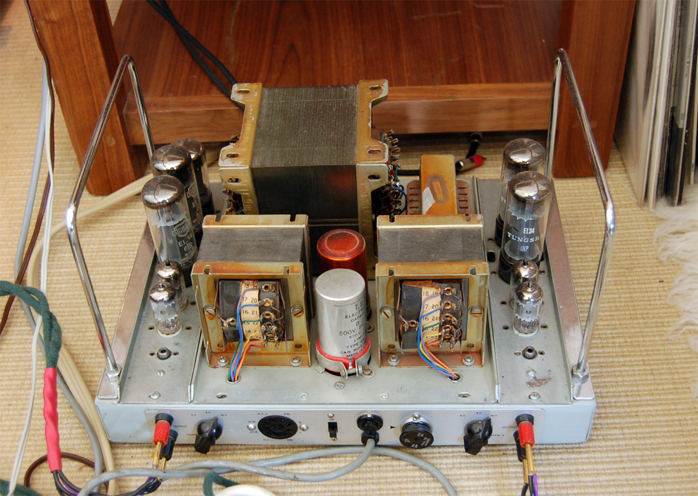 But the combination of really high overall feedback and a low-power tube design is exactly what the original Quad ESL needs... too much power and you can arc the panels; less feedback and the amp can't deal with the incredible load variation (2 ohms to 40 ohms) presented by the speaker, which resembles a giant capacitor (rather than a more ideal resistor) from an amplifier's point of view. The tube complement is a pair of EL-34s per channel, one 6U8 phase splitter tube per channel and one of EF86 driver tube per channel, along with a single GZ34 rectifier for the entire unit. "The original caps were all electrolytic. It would have been nearly impossible to recap at such high capacitance and not stay with electrolytic due to size issues, so nearly all the new caps are humble Sprague Atoms. One pair are Russian PIO bought NOS from the Ukraine and one pair are Jensen coppers. I kept all resistors original as far as possible; where I had to replace them, I used Allen-Bradley carbon-comp or, where A-B values were unavailable, Riken Ohms. Quite a bit of rewiring was necessary too. 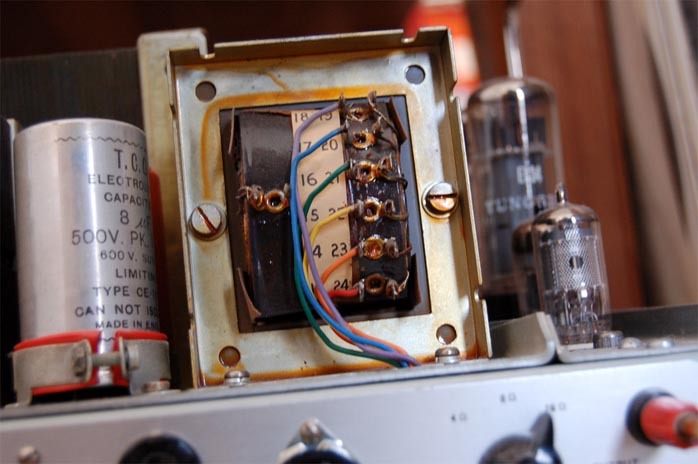 "I really ought to replace the rest of the wiring, plus the switch, power cord and the RCA sockets. Tons of oxidizing, corrosion and general decay in there. Plus put in a pair of motor run caps in the HV section. And deal with straightening out a buckled top plate which could reduce transformer hum (audible about a foot or two away, not through the speakers though). I've got all the components, just haven't bothered because it sounds so good already. I've never heard another amp that drives the Quads with such ease and authority." You will see a few of the other amps Patrick has hanging around the apartment including the Leak Stereo 20 (which undoubtedly enjoys the best view of any amplifier I've met), a Bedini 25/25 and a pair of Bottlehead Paramours which Patrick built. Another sleepless beauty, the Quad ESL-57 is a timeless musical machine. There's been so much written about the ESL-57s from Gary Krakow's MSNBC article to Art Dudley's Listening column on refurbishing a pair, that I think I can again get away with a few cursory remarks. Peter J. Walker brought out the ESL-57 in 1957 (that may seem to go without saying, but its successor, the ESL-63 came out in the early 1980s) and they remained in production for 25 years. ESL stands for "Electrostatic Loudspeaker" which is what they are - charged panels of coated polyester film being pushed and pulled within an electrostatic field. 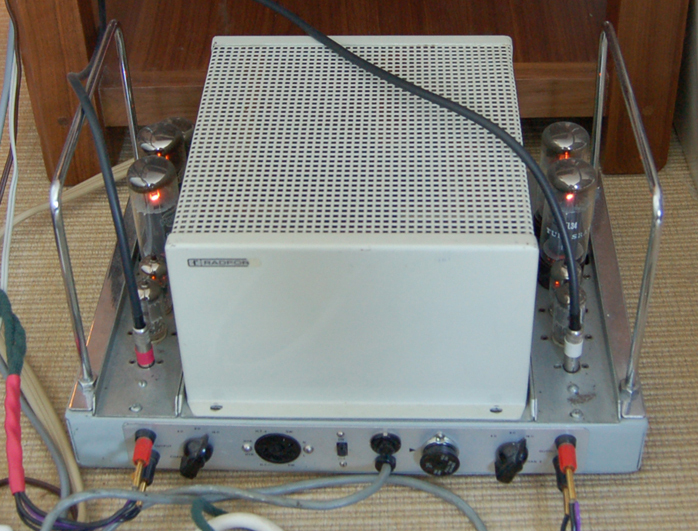 The excellent Quad website has tons of information including a page on amplifiers by Christian Steingruber. 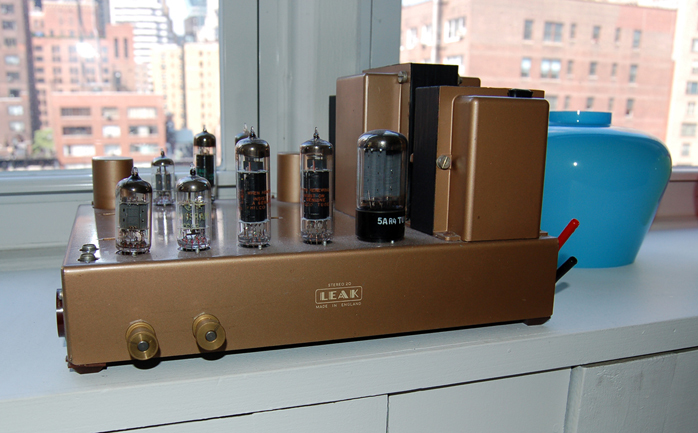 Here you'll learn among other things that Ken Kessler, who authored the lovely coffee-table sized "Quad: The Closest Approach", suggests the Radford is a superior amplifier to Quad's own tube contenders.